The scientists are using space in the Sanford Underground Research Facility (SURF) in Lead, South Dakota, to work on a project called the Compact Accelerator System for Performing Astrophysical Research (CASPAR). Notre Dame’s involvement with SURF has its origins in a facility called the Deep Underground Science and Engineering Laboratory (DUSEL), planned by the National Science Foundation (NSF) as a complex of laboratories for research in multiple fields: biology, chemistry, geology, as well as physics. Notre Dame researchers were especially interested in one aspect of the DUSEL concept called DIANA (Dual Ion Accelerators for Nuclear Astrophysics). And with good reason, according to Robert J. Bernhard, the University’s vice president for research. “The nuclear astrophysics community identified DIANA as a priority, and identified Michael Wiescher to lead that facility,” Bernhard said. Wiescher, the Freimann Professor of Nuclear Physics at Notre Dame, led the planning for the DIANA portion of the NSF proposal. That is, right up until sequestration of federal spending made funding of the project impossible. 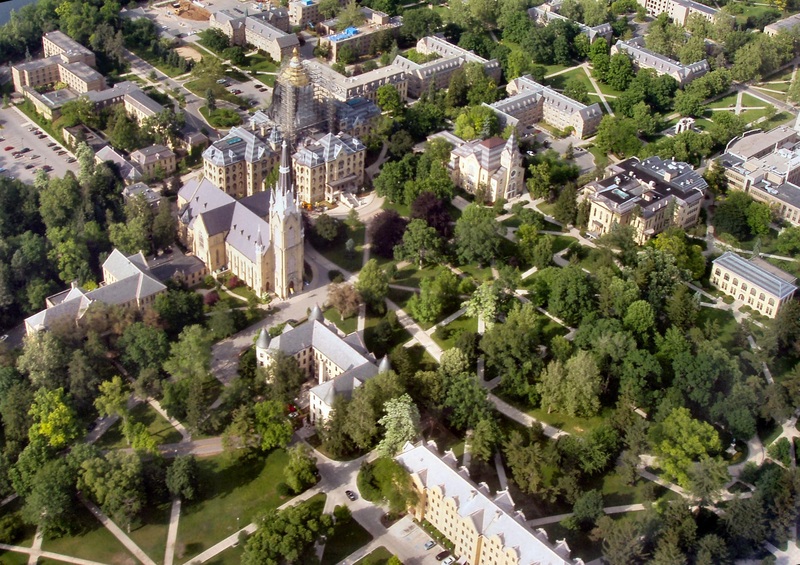 The NSF would eventually ask Wiescher and Notre Dame to withdraw the DIANA proposal, with hopes of one day revisiting it. Moving ahead with a smaller project allowed the NSF to still be involved, while a coalition of other partners was formed, including the South Dakota School of Mines and Technology, and Colorado School of Mines. The collaborative nature of CASPAR is indicative of a trend in scientific research at large, and especially at Notre Dame, according to Bernhard. For its part, Notre Dame is strategically investing in labs and equipment that serve multiple researchers and collaborative programs. ”Instead of buying equipment for individual labs, we’re directing funding in high performance, shared facilities such as the integrated imaging facility, the center for nano research and technology, the genomics and bioinformatics facility, the mass spectrometry and proteomics facility,” Bernhard said. That same philosophy is at work at SURF, which, like CASPAR, has its own indirect path to realization. The Homestake Mine was founded after an expedition led by George Armstrong Custer discovered gold in South Dakota’s Black Hills in 1874. Five years later, the Homestake Mining Company began operations, eventually carving out 370 miles of tunnels as deep as 8,000 feet, creating one of the deepest mines in the country. The gold vein was eventually exhausted after producing 1.25 million kilograms of gold in its lifetime (roughly $80 billion at today’s rates), and Homestake shut down in 2001. The closing of Homestake resulted in an economic and identity crisis for Lead and the surrounding area. However, in addition to its gold mining past, Homestake had a unique astrophysics connection. The Compact Accelerator System is modular, to allow for transport down the mine shaft. In 1965, Ray Davis, a nuclear chemist from Brookhaven National Laboratory, began building an experiment deep in the Homestake mine with the goal of counting neutrinos, subatomic particles produced in fusion reactions inside stars. In 2002, Davis was awarded a share of the Nobel Prize for Physics for his neutrino work at Homestake. When Homestake announced it would close the mine, physicists, aware of Davis’ neutrino success, proposed converting it into a deep underground laboratory. In 2004, the South Dakota Legislature created the South Dakota Science and Technology Authority (SDSTA) to work with the scientists proposing the lab. In 2006, Homestake Mining Co. donated the underground mine to the SDSTA. Also in 2006, the SDSTA accepted a $70 million gift from South Dakota philanthropist T. Denny Sanford, who stipulated that $20 million of the donation be used for a Sanford Science Education Center. Then the real work began, according to Ani Aprahamian, Notre Dame’s Freimann Professor of Experimental Nuclear Physics and a member of SDSTA’s board. The first step in that transformation was to pump millions of gallons of water out of the tunnels of the old mine. That task took months. Then came the installation of the power and technology infrastructure required in the roughly 4,400 square feet occupied by CASPAR. Meanwhile, the group of Notre Dame astrophysicists had to devise a way to disassemble and move an accelerator that had been on campus for 10 years to its new underground home. When it arrived, the equipment was brought down the mine shaft via infrastructure originally designed to move men and minerals, not highly sensitive scientific equipment. Robertson recalls the series of roughly two-mile trips from the surface to the underground lab taking upwards of 45 minutes because of the pace at which the conveyances had to travel with accelerator parts on board. It’s just one of the ways the space’s mining past is meeting its scientific present. Indeed, a visit to CASPAR is unlike a visit to any other laboratory environment. It starts with a comprehensive safety briefing and signing of a series of waivers. Before descending into the mine, one dons overalls, steel-tipped boots, safety goggles and a hard hat and attaches a carbon monoxide detector around the waist. Next, you pick up a gold medallion with a number inscribed on it and enter your name and number on a clipboard. If the medallion is missing at the end of the day, it becomes clear that someone is still underground in the mine. While certainly effective, it’s a fascinating juxtaposition in the highly technical work of exploring the origins of the universe. The descent into the mine takes place in a cage that, at most, holds 15 people. The approximately mile-long trip takes 10 minutes without lab equipment, which requires a slower pace and more time. Yet even those 10 minutes can seem longer. The only light in the cage is from a headlamp on the cage operator’s hard hat, which briefly illuminates the wood supports and rock pilings framing the shaft. After the descent, you arrive at what is familiarly called the 4850 Level of SURF. You exit into a surprisingly well-lit area with tunnels, or “drifts” in mining parlance, running right and left. CASPAR is located through the left, mile-long tunnel. It’s a startling experience to emerge through the dark tunnel and enter the pristine, high-tech environs of CASPAR. 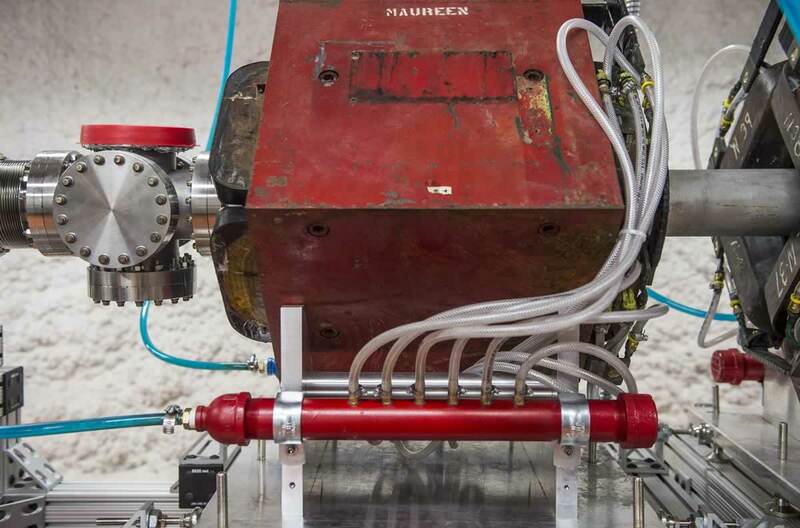 There, Notre Dame researchers and doctoral students have nearly completed reassembly of the accelerator that was shipped in parts from Notre Dame, like an incredibly complex jigsaw puzzle. Experiments are expected to begin in the summer of 2016. The groundbreaking scientific breakthroughs the CASPAR researchers are seeking cannot be achieved without the invaluable technical expertise of the former Homestake miners, who were brought back to operate and maintain the mine equipment still being used. The miners and astrophysicists have formed a close working relationship, and Wiescher indicates there is a bond between the two groups that extends beyond just the common workspace. In other words, Notre Dame researchers are using a retired gold mine in a town called Lead, to determine what reactions lead to the formation of gold in stars, among other things. CASPAR is on schedule to be the first such project of its kind to yield results. When it does, Wiescher said the knowledge will have implications across multiple fields of study, most obvious astronomy and the material sciences. Robertson adds that sometimes these kinds of experiments yield other technologies that have broad public familiarity. Nuclear physics experiments have been instrumental in developing MRI and PET scans, for example. While those kinds of outcomes are not an intended goal of projects like CASPAR, Bernhard believes in today’s world they’re nonetheless critical. For now, the precious gold researchers seek is a deeper understanding of our universe. It happens that the best way to do so is to build a deeper lab, where the cosmos can be shut out in hopes of revealing its secrets. A nuclides chart is designed to help researchers study the nucleosynthesis of elements—or how they are created. Just outside a thick lead door leading to the Compact Accelerator System for Performing Astrophysical Research (CASPAR) in the experiment’s control room, hangs a massive chart. Hundreds of small, colorful blocks identify some of the universe’s smallest units in three vibrant bands that streak across the chart. It is as if an artist took a brush and swiped it across the page. But it isn’t a painting; it’s the chart of nuclides. “The periodic table is a chart of atoms, but this is a chart of just the nuclei of those atoms—the stable and unstable isotopes of those atoms,” said Mark Hanhardt, support scientist for Sanford Underground Research Facility (Sanford Lab). “Here, we don’t take into account the electrons at all—just the nucleus.” Hanhardt, a Ph.D. candidate in physics at the South Dakota School of Mines and Technology (SD Mines), is focusing on CASPAR. While the periodic table allows scientists to understand the chemical properties of elements, this chart is specifically designed to help researchers study the nucleosynthesis of elements—or how they are created. What happens to a nucleus if a neutron is added? If a beta decay occurs? Scientists can locate an element’s nuclei on the chart and visualize the changes that occur at a nuclear level. The numerous details contained in this chart are a bit dizzying. To explain just how this powerful tool is used, Hanhardt has developed a simple analogy. The CASPAR collaboration will use a low-energy accelerator to study the creation of elements inside the heart of stars; using this “game board” helps them explore and track the evolution of elements over time. Rule 1: Start at the beginning. The Big Bang created two elements—hydrogen and helium. From hydrogen and helium, there are multiple ways to “level up” to a heavier element. The first is through nuclear fusion, which pushes two elements together, creating a heavier element. Other processes include the slow capture of individual neutrons (called the s-Process), the collision of two stars (called the r-Process) or the beta decay of a neutron. Rule 3: Follow the Valley of Stability. The rules help researchers better understand how elements can evolve over time. The CASPAR collaboration is most interested in what is called the Slow Neutron Capture Process, or the s-Process. The s-process accounts for the creation of half of all elements heavier than iron. “Without the s-process, the universe would be very boring, and it probably would not have complex life,” said Strieder. Here’s how the s-process works, according to Hanhardt. Through this very slow process, you take a jagged path up the chart, building many of the heavier elements. In order for this process to happen, though, there must be a free neutron available. That’s a bit more difficult that it sounds. Scientists have a pretty good idea where this happens: in multi-layered stars called thermally pulsing asymptotic giant branch stars (TP-AGB). An example of such a star is “Mira” in the constellation Cetus. What they don’t know, however, is the rate and energy at which the neutrons are produced and captured. Two upcoming CASPAR experiments aim to discover just how quickly those neutrons are created and how they join other elements over time. New ultraviolet images from NASA’s Galaxy Evolution Explorer show a speeding star that is leaving an enormous trail of “seeds” for new solar systems. The star, named Mira (pronounced my-rah) after the latin word for “wonderful,” is shedding material that will be recycled into new stars, planets and possibly even life as it hurls through our galaxy. To study these rates, researchers at CASPAR hope to duplicate the reactions they know occur in TP-AGB stars, creating free neutrons. They will be the first people on earth to study these reactions at a low energy—an energy that is the same in the heart of the star. These are big questions to ask of such little reactions. However, it is a fundamental piece in the universal puzzle. Biesiadzinski himself is responsible for planning and carrying out tests during the assembly of time projection chamber (TPC), the main detector for LUX-ZEPLIN experiment (LZ). Currently being constructed on the 4850 Level at Sanford Underground Research Facility (Sanford Lab), this main detector consists of a large tank that will hold 7 tonnes of ultra-pure, cryogenic liquid xenon maintained at -100o C. All the pieces of this detector are designed to function with precision; it’s Biesiadzinski job to verify that each part continues to work correctly as they are integrated. That includes hundreds of photomultiplier tubes (PMT). The most recent test was piecing together an intricate mock array for the PMTs, which will detect light signals created by the collision of a dark matter particle and a xenon atom, inside the main detector. In a soft-wall cleanroom in the Surface Laboratory at Sanford Lab, Biesiadzinski and his team carefully practiced placing instruments like thermometers, sensors and reflective covering. They practiced installing routing cabling, including PMT high voltage power cables, PMT signal cables and thermometer cables. These tests will make the installment of the actual LZ arrays much smoother. In total, there will be 494 PMTs lining the main detector. If a WIMP streaks through the tank and strikes a xenon nucleus, two things will happen. First, the xenon will emit a flash of light. Then, it will release electrons, which drift in an electric field to the top of the tank, where they will produce a second flash of light. Hundreds of PMTs will be waiting to detect a characteristic combination of flashes from inside the tank—a WIMPs’ telltale signature. The PMTs used for LZ are extremely sensitive. Not only can they distinguish individual photons of light arriving just a few tens of nanoseconds apart, they can also see the UV light produced by xenon that is far outside the human vision range. The X-Y location of events in the detector can be measured using the top PMT array to within a few millimeters for sufficiently energetic events. To insure every bit of light makes its way to a PMT, the inside surfaces of the arrays are covered with Polytetrafluoroethylene (PTFE or teflon), a material highly reflective to xenon scintillation light, in between the PMT faces. “This way, photons that don’t enter the PMTs right away—and are therefore not recorded—are reflected and will get a second, third, and so on, chance of being detected as they bounce around the detector,” said Biesiadzinski. Researchers will also cover the outside of the bottom array, including all of the cables, with PTFE to maximize light collection there. Light recorded there by additional PMTs that are not part of the array, allow us to measure radioactive backgrounds that can contaminate the main detector. In addition to being very specific, these PMTs are also ultra-clean. “By clean, we mean radio-pure,” said Briana Mount, director of the BHUC, where 338 of LZ’s PMTs have already been tested for radio-purity. The tiniest amounts of radioactive elements in the very materials used to construct LZ can also overwhelm the rare-event signal. Radioactive elements can be found in rocks, titanium—even human sweat. As these elements decay, they emit signals that quickly light up ultra-sensitive detectors. To lessen these misleading signatures, researchers assay, or test, their materials for radio-purity using low-background counters (LBCs). 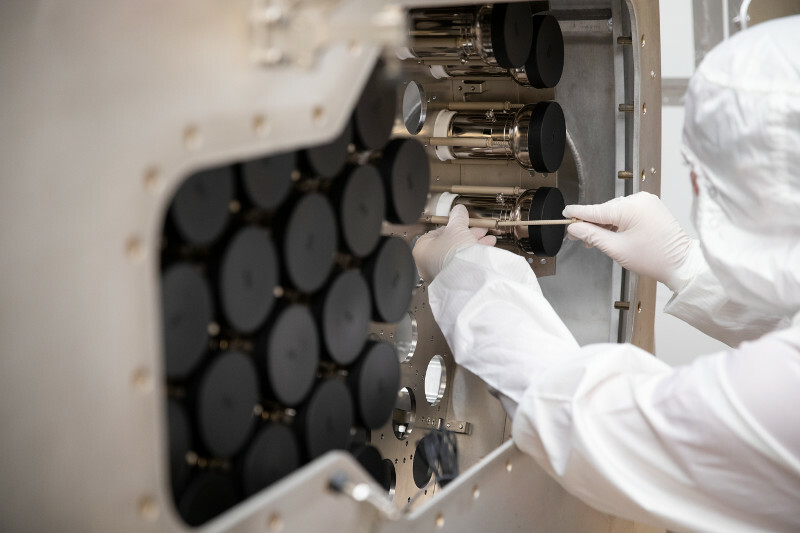 “Our PMTs are special made to have very low radioactivity so as to not overwhelm a very sensitive detector like LZ with background signal,” said Biesiadzinski. Testing the PMTs at the BHUC allows researchers to understand exactly how much of a remaining background they can expect to see from these materials during the experiment. Mount explained that most of the samples currently being assayed at the BHUC are LZ samples, including cable ties, wires, nuts and bolts. For a visual description and breakdown of LZ’s design, watch this video created by SLAC. More than 6,500 rock bolts, 1,100 pounds of wire mesh went into rehab project on 4850 Level. For more than two years, Fritz Reller, a member of the Underground Maintenance Crew (UMC), focused on installing ground support in the East Drift of the 4850 Level. He removed thousands of rocks, drilled more than 6,500 holes for rock bolts and secured over 1,100 panels of welded wire mesh through an area that covers approximately 1,850 feet between the Yates Shaft and Four Winze Wye. The drift is used to convey scientists, crews, contractors and equipment via locomotive between the Davis and Ross Campuses. Luke Scott, UMC lead, knows first-hand what goes into ground support. He worked for nearly 14 years at Homestake and 10 years at Sanford Lab. 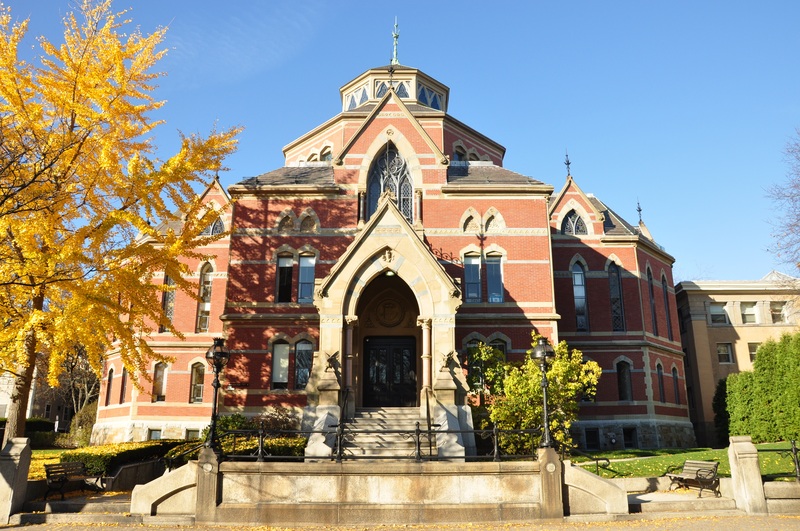 His team, which included infrastructure technicians Reller, Mike Oates and Bill Geffre, excavated the Davis Campus and helped prepare the space for outfitting. They also put in ground support for CASPAR (Compact Accelerator System for Performing Astrophysical Research) and the Black Hills State University Underground Campus, both existing spaces once used as shops and maintenance areas by Homestake. The work is physically challenging. Crews must first bar down the drift to remove any loose rock. They use jackleg drills that weigh more than 100 pounds to drill thousands of holes in hard rock then drive the rock bolts. All to make the space safe for stakeholders. For more than two years, Reller barred, meshed and bolted along an 1,850-foot drift on the 4850 Level of Sanford Lab. He did it meticulously and without a single safety incident. Installation of a detector designed by UC Santa Barbara physicists is underway at the LZ dark matter experiment. There’s a big hole in our current understanding of what makes up the universe. Normal matter — the stuff in people, planets and pulsars — can account for only 16 percent of the mass in the universe. Scientists know there’s more out there because they can see its effects: Its gravity bends light from distant sources and keeps galaxies from spinning themselves apart. Dark matter doesn’t appear to interact with normal matter via electromagnetism or through the strong nuclear force, which is known for binding particles together in the nuclei of atoms. Aside from gravity, that leaves one other force: the weak force, which is involved in radioactive decay. A leading hypothesis is that dark matter may be composed of exotic particles that have a high mass and interact with normal matter only through gravity and the weak force. Scientists call these weakly interacting massive particles, or WIMPs, and the search is on to find out if they exist. UC Santa Barbara physics professors Harry Nelson and Michael Witherell (now the director of Lawrence Berkeley Laboratory) have researched dark matter since the 1980s. About 10 years ago, some of their collaborators proved that liquid xenon was a superb medium for detecting WIMPs. Nelson and Witherell joined to help put together the Large Underground Xenon (LUX) experiment. The experiment was essentially a 32-gallon vat of liquid xenon that could detect when a single xenon atom was struck by a WIMP. It was located at the Sanford Underground Research Facility, roughly a mile under the Black Hills of South Dakota. This mile of rock shields the detector from the stream of particles that shower down on Earth’s surface every day. “We led the world in sensitivity in the hunt for WIMPs,” said Nelson. Since LUX came online in 2013, a number of similar, larger detectors in Italy and China joined the hunt. An international race was underway, and the LUX team proposed the LZ experiment, a $70 million upgrade and unification of the LUX and the UK-based ZEPLIN III teams. 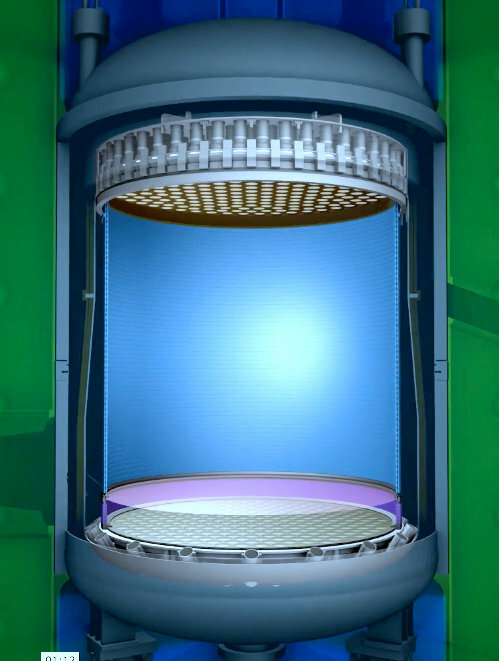 The LZ detector is designed to leapfrog the competition, and will contain 850 gallons of liquid xenon, about 27 times the volume of LUX. The new experiment will be so sensitive that it has to account for false positives from solar neutrinos, explained Nelson. Neutrinos are particles so ephemeral that co-discoverer and Nobel laureate Frederick Reines called them “the most tiny quantity of reality ever imagined by a human being.” Trillions of them pass straight through your body every second. Nelson, Witherell and a team of engineers and students designed the outer detector for the LZ experiment, starting in 2012. The outer detector consists primarily of four 12-foot-tall, clear acrylic tanks that will surround the core detector. The fabrication of these tanks proved a challenging, Nelson noted, giving credit to Reynolds Polymer Technology of Grand Junction, CO, who took on the task. 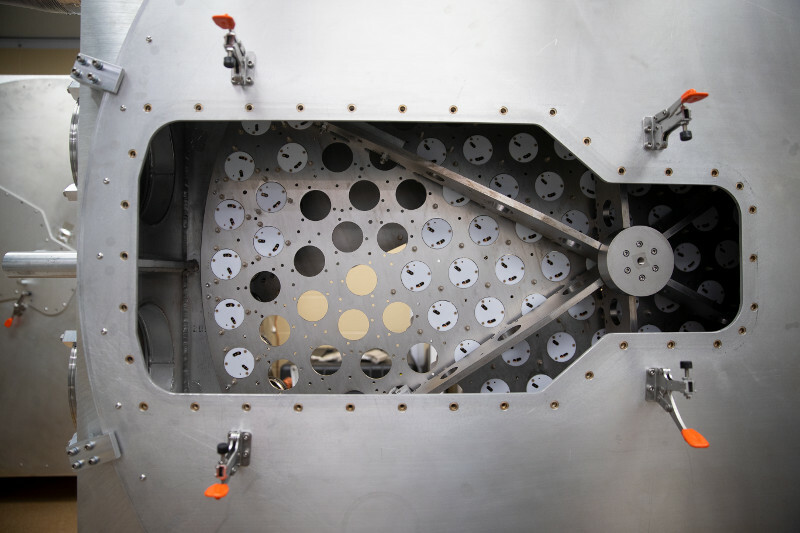 The scientists will fill these tanks with a liquid that produces a small flash when hit by a particle, allowing them to distinguish a WIMP event from background radiation coming from radioactive impurities in the detector or the few conventional particles that manage to penetrate the rock above. Two of the four tanks, recently completed, will make the long journey underground later this month. “The logistics of building a large apparatus underground, accessible only by narrow tunnels, forces us to install the outer detector prior to the LZ liquid xenon detector,” Nelson said. The LZ experiment is scheduled to turn on in 2020 and should grab the lead in the hunt for WIMPs back from the Italians, whose current Xenon1T project contains about 271 gallons of liquid xenon. The Xenon1T team has plans for an upgrade to rival LZ, however, so the race is still on. 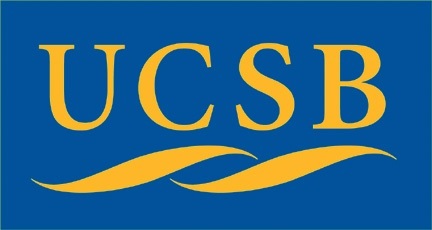 Additional project collaborators at UC Santa Barbara include postdoctoral scientist Sally Shaw; engineers Susanne Kyre, Dano Pagenkopf and Dean White; and graduate students Scott Haselschwardt, Curt Nehrkorn and Melih Solmaz. The LZ group is supported by the U.S. Department of Energy’s Office of High Energy Physics. Science thrives in a world-leading research facility. This line, or some version of it, has been the lead for countless stories centering on the Sanford Underground Research Facility (Sanford Lab). It’s a tantalizing hook—a vision of sagging rafters and drifts lined with jagged, untouched dikes of gold. Audiences love it, reading on if only to discover what could be happening in this deep, forgotten space. When encountering the rich history of this area—a thriving gold mine, delving 8,000 feet below a modest mining town with houses crouched on steep hillsides—it’s tempting for writers to create a ghost town of Lead and a decrepit caricature of the Homestake Gold Mine. There’s just one problem, though—this facility is anything but abandoned. Shortly after the sprawling Homestake Gold Mine closed in 2002, an uncertain future and expensive maintenance costs forced Barrick Gold Corporation, which owned the mine, to switch off the dewatering pumps. Silencing these motors allowed water to begin rising unhindered. It spilled across the floor of the 8000 Level, inching its way up the shafts and filling one level after another. The steady rise of the water submerged rail tracks, tools, utility lines and even the underground hoistrooms—the mine truly did seem abandoned. On the surface, however, discussions about the mine’s future had only begun. The National Science Foundation had taken notice of Homestake Mine, eyeing it as a possible future sight for the United States’ pioneering Deep Underground Science and Engineering Laboratory (DUSEL). Although the wheels of politics and financial support turned slowly, the efforts to turn the Homestake Mine into a science facility became a reality and with a generous donation from the facility’s namesake T. Denny Sanford, a land donation from Barrick Gold Corporation and the formation of South Dakota Science and Technology Authority (SDSTA), the Sanford Underground Research Facility was born. It was a messy job, mucking out the 4850 Level, but you’d be hard-pressed to find traces of mine dust in the Davis Campus today—especially in the class-1000 cleanroom that houses the MAJORANA Demonstrator. Shotcreted walls, gleaming floors and espresso machine, make it possible for researchers and others to forget they aren’t in an ordinary office space—if only there were windows. Battery-powered locomotives rumble through the East Drift, making the daily commute to the Ross Campus a bit shorter as it motors infrastructure technicians and researchers between the two campuses. Far from decrepit, the facility is carefully maintained so scientists can conduct research safely. The Underground Maintenance Crew maintains more than 12 miles of underground space for science by bolting rock, maintaining ventilation paths and assessing infrastructure. A massive project—the rehabilitation of the Ross Shaft—reached a milestone when the work reached the 4850 Level in 2017. Crews stripped out old steel and lacing, cleaned out decades of debris, added new ground support and installed new steel to prepare the shaft for its future role in world-leading science. But that’s just half the battle. It’s really all the work that goes into making it a functional science facility that matters: access, utilities, cleanliness, and, most importantly, a team that has at the top of their priority list the success of the science. “There is simply no other place like Sanford Lab,” Fiorucci added. Science resumed on the 4850 Level for the first time in decades with the MAJORANA Demonstrator Project. In 2011, researchers began electroforming the world’s purest copper in a temporary cleanroom in the Ross Campus. The Majorana experiment uses pure germanium crystals enclosed in deep-freeze cryostat modules, protected by copper and lead shielding to answer one of the most challenging and important questions in physics: are neutrinos their own antiparticles? And if they are, what role do they play in the formation of the universe? In the existence of humans? “Being able to do chemistry like electroforming so far underground is a huge advantage for both the MAJORANA Demonstrator project and future physics experiments that need to avoid cosmic radiation,” said Cabot-Ann Christofferson, a researcher with the Majorana Demonstrator and a chemistry instructor at SD Mines. While the 10 operating baths plated the world’s purest copper for the Majorana collaboration, the Large Underground Xenon experiment (LUX) began moving into the Davis Campus just one kilometer away. And just three months after it began scouring the universe for Weakly Interacting Massive Particles (WIMPs), LUX was declared the world’s most sensitive dark matter detector in October 2013. As Sanford Lab began to realize its potential, its reputation grew. As leading projects seek space within these coveted walls, hundreds of researchers come from hundreds of institutions across the globe, sprinkling the drifts with distinct accents and cultures, all united by a desire for shared discovery. The facility has become a vibrant space for research—and a touchstone for STEM and higher education outreach. Excited K-12 students try their hands with design challenges; wide-eyed undergraduate students collect biology samples, switch physics samples in low background counters or guide programmed robots through an obstacle course for the annual Robotics Competition; and doctoral students test, assemble, monitor, adjust and patiently wait for the universe’s most rare events to occur and signatures to appear—all the while planning for the next generation of their research. The research has not stalled with Majorana and LUX. The scientific strides taken by Majorana helped demonstrate the usefulness of a larger, next-generation experiment, LEGEND 200. LUX-Zeplin (LZ), the next generation of LUX, is being installed in the Davis Campus—just down the drift from Majorana. And then there’s the Deep Underground Neutrino Experiment (DUNE). Powered by the Long-Baseline Neutrino Facility (LBNF), this massive experiment is expected to draw in even more revenue and jobs—and, of course, science. The experiment is hosted by Fermi National Accelerator Laboratory and includes significant contributions from CERN and several countries. According to a report completed by Anderson Economic Group, LLC, for Fermilab, this project is anticipated to flush $950 million into South Dakota’s economy, generate $340 million in income for South Dakota households, and create almost 2,000 jobs in the region at the peak of construction. 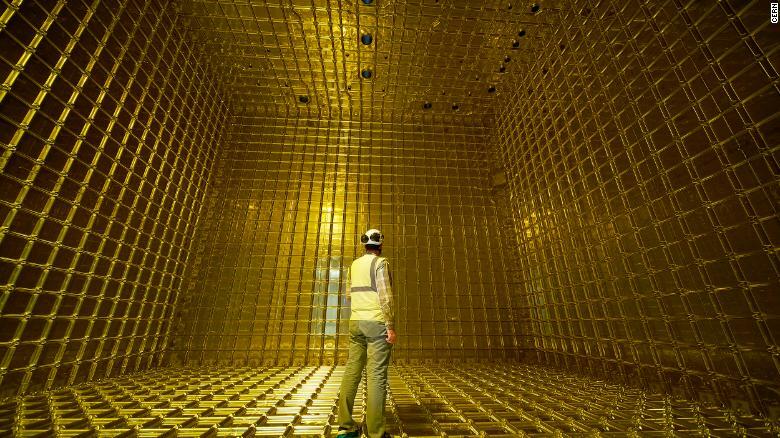 DUNE also happens to be the largest underground neutrino experiment in the world. The true testament to the vibrant life at Sanford Lab is the people that who work in the drifts, offices, and science laboratories every day. Strikingly different—and incredibly necessary—tracks of life intersect at Sanford Lab. Riding the 7:30 a.m. cage, you might rub shoulders with a dedicated infrastructure technician who grew up in Central City and has been a part of this underground network’s legacy for fifty years. On your left, you could meet a visiting researcher from Scotland, here to inspect data from his astrophysics experiment at CASPAR. Listening close, you’ll hear voices discuss the day’s work in one breath and their daughter’s soccer tournament in the next. On the surface, then again on the 4850 Level, workers gather to review the day’s safety and procedure overviews. You can hear their chatter, and often laughter, echo down the drift. Later, an espresso steams in a researcher’s mug in the Davis Campus while he checks his email for updates from the surface. Other workers motor slowly to the Ross Campus, passing an unassuming sign on the side of the drift that reads: Future Sight of LBNF/DUNE, reminding them that even more neighbors are about to move in. “While the facility was once an active mine with a deep legacy, it’s now a laboratory making its own rich history in science,” said Headley. Sanford Lab is a place where life is lived in the extremes, a place of vibrant growth—a place that is anything but abandoned.